A mother's love is the greatest gift. 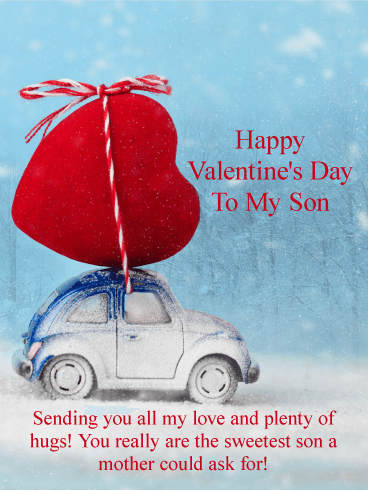 Take a moment to let your own mother know how much you cherish her with this beautiful Valentine's Day greeting card. Love makes life more beautiful and meaningful. Your mother will adore that you remembered her on Valentine's Day. Warm your mother's heart and make her smile with a thoughtful and gorgeous Valentine's Day card. 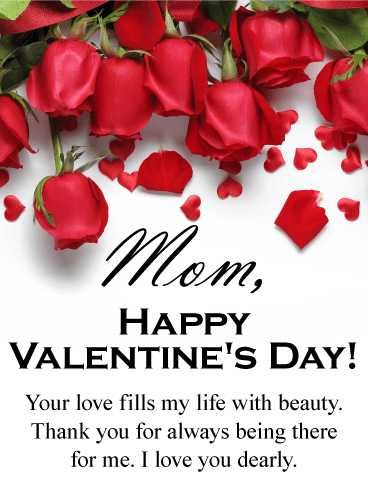 Mom, Happy Valentine's Day! - Your love fills my life with beauty. Thank you for always being there for me. I love you dearly. This little guy wears his heart on his sleeve...and in his paws! We can't think of a more doggone sweet way to let your sweetheart know that you're simply crazy about them than with this simple yet adorable Valentine's Day card. It's the perfect way to reveal your romantic side to someone you just started dating or the one you've been with for (dog) years! Daughters make a mother's heart overflow. 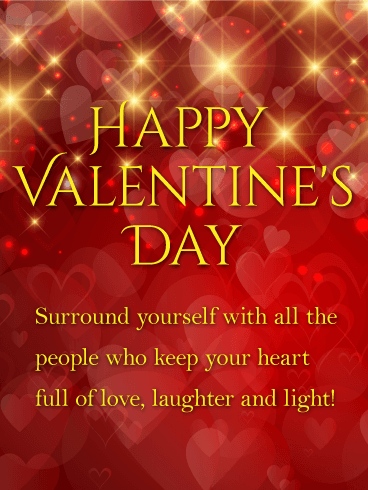 Send your sweet daughter a loving Valentine's Day greeting card today. 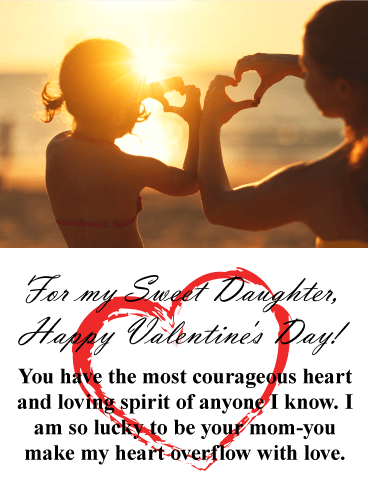 Valentine's Day cards for daughters are some of the most special messages to send. Tell your daughter how courageous she is and how lucky you feel to be her mom. This precious Valentine for a dear daughter is a beautiful way to spread love this holiday. Two interlocking hearts are joined together, with a smaller heart cradled in the center, creating the ultimate romantic symbol for your Valentine. A timeless red background contains a beautiful expression of love to the one you share everything with and can never live without. What a wonderful time to let them know! Daughters are as sweet as candy! Treat your amazing daughter to a scrumptious Valentine's Day card this year. Make her feel truly loved with sprinkles and hearts and all the warm fuzzies her heart can hold! This pretty pink Valentine's Day card will delight your daughter. 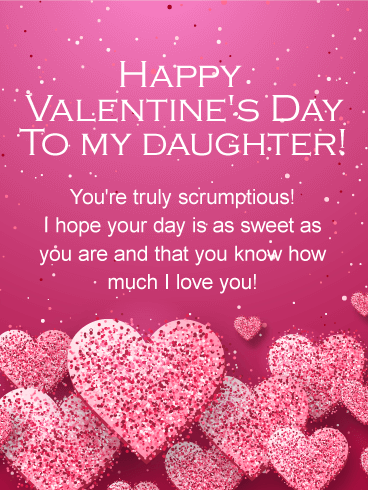 The sweet Valentine's Day message will make your daughter's day extra special. 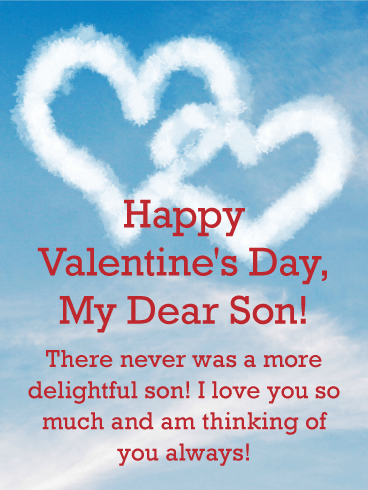 On this day of love, who better to send a Valentine to then your amazing daughter? A beautiful sunset and an endless stretch of ocean. 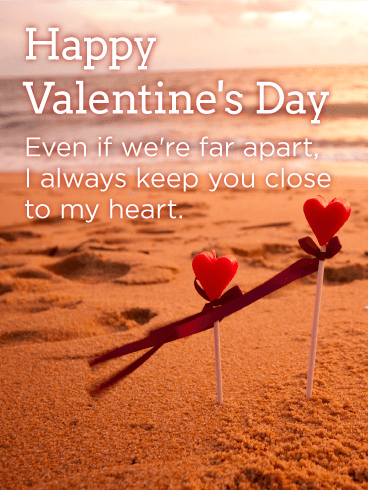 The romantic scene on this Valentine's greeting card helps set the tone for the touching message below: "Even if we're far apart, I always keep you close to my heart." It's a wonderful way to remind someone you love that while you may be separated physically, in your heart, the two of you remain close together. How can you resist this pair of cute little puppies? 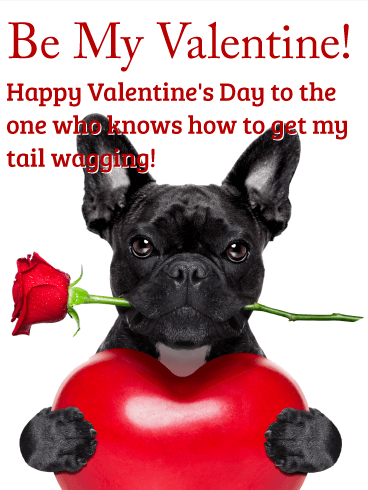 They help make this Valentine's Day greeting that much more "adogable"! 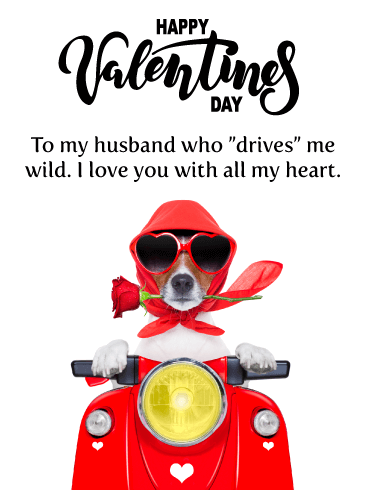 We know your sweetheart will fall in love with this Valentine's Day card, both for the charming message and of course for the canine couple. 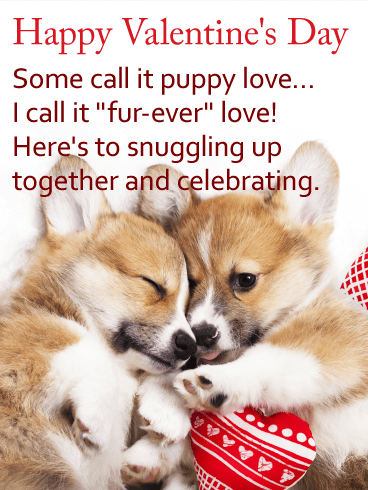 It's a romantic gesture for a new relationship of someone you've been with "fur-ever"! Two of the sweetest, most mouthwatering lollipops are wrapped up and ready to be savored! 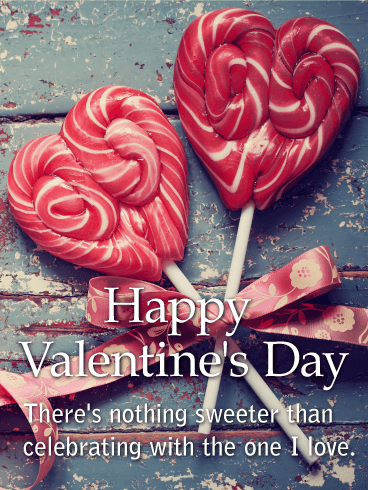 If this treat isn't enough to make your Valentine smile with delight, then the simple but charming message will: "There's nothing sweeter than celebrating with the one you love." 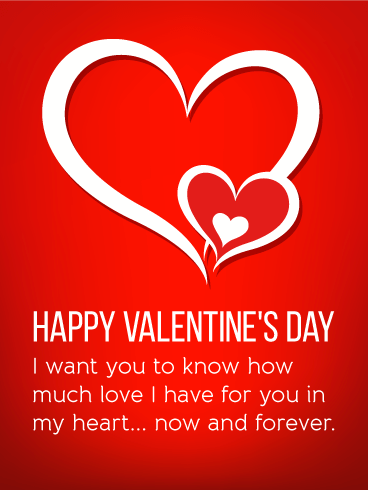 No matter who you send this special Valentine's Day card to, we know they'll definitely agree! 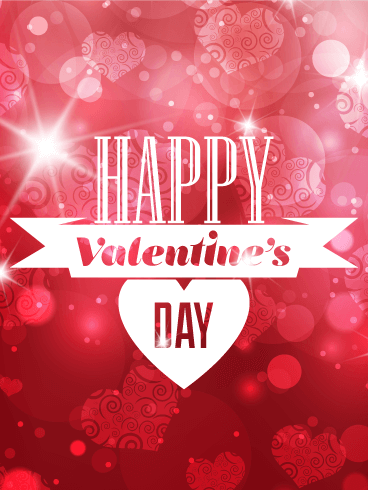 This festive Valentine's Day card is the perfect way to wish anyone a Happy Valentine's Day! A classic red background filled with brilliant hearts is set off by a short but simple greeting. Whether it's a friend, a family member or even a little Valentine in your life, they'll love being surprised by this thoughtful card.